I had my first really good sushi while visiting my sister in NY. Meet my new crave. The Crunchy East from SUteiShi. Avocado, cucumber, spicy salmon, scallions and these super delicious crunchy toppings that bring a WOW to your mouth. Or as my brother in law would say, it's like a flavor explosion. This sure beats the airplane and generic California roll fare I've had around here! Do you like sushi or does it scare you? What's a must-try for this sushi novice? Anyone know of a good place around Houston? I'm hooking up with other Sweet Shots at Darcy's place. Wow, that looks fabulous! I tend to go vegetarian with sushi, but I think I'd be willing to give that one a shot! Oh my goodness! That looks so delicious. I want some. Yum! Cool shot...love the color. I have only had vegetarian... the rest sorta scares me. ;) But I LOVE this shot! You're obviously a much more ambitious eater than I am - I get stuck in a rut and won't try anything new... HOWEVER, this actually looks really good. Had a really, REALLY bad experience with sushi locally. Stunk so badly we couldn't even touch it. Rotten seaweed, anyone? But that sushi kinda looks good to me. If I ever met up with you in your Home State, and I wasn't preggo, I may be willing to try it! YUM!!! Looks delish. I love spicy tuna but it has to be done a certain way - not minced, whole tuna. It always helps to know the owner and restaurant manager - that way you know you aren't getting bad sushi! I love the idea of sushi, and the look of sushi...but I don't know about the taste. I have never had sushi before. Adam said he got sick from eating when he was younger, and it has me a bit freaked out. Perhaps I will get brave one day though! i will not be eating that. mmmm, I love a good raw salmon and avacado nori roll. And I love beef tataki (beef that is just seared for a few seconds each side, served cold). Being in Australia, the Japanese population is large, so finding good sushi isn't hard unless you live out bush. But there is such a difference between the takeaway, mass produced sushi and a real sushi restaurant or even a sushi train. Just, if you ever buy raw salmon make sure its a place that looks clean in a clean area, the salmon can look perfectly good, well coloured, smells good, but the few times I have gotten worms from it, It's been after eating at a place I had reservations about. And the only time I've ever actually gotten ill from it, was a place I knew not to eat from, but did anyway thinking 'how bad can it be'. I'm so proud of you for trying sushi!!! 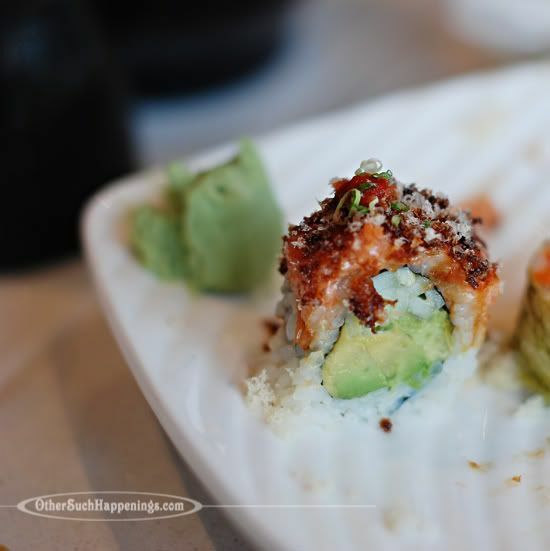 We love us some sushi here--there are places on every corner. We'll have to take you to our favorite, Yo Sushi, next time you're here. It's cheap, yet delicious and not at all sketchy :) My favorite right now is the Godzilla--deep fried shrimp, spicy tuna, cream cheese and cucumber--YUM!! Aubs loves the Crunchy Roll which has those crunchy shenanigans on top. Can't wait to take you there, Marshy! I love you! Seriously....you just made my mouth water from the photo & description!!! I think sushi is in my near future! Beautiful shot! I love sushi. Love it. Even the generic grocery store kind. LOVE it. LOVE it! LOVE IT! I always love coming here. Remind me why I don't come every day Marsha, Marsha, Marsha.